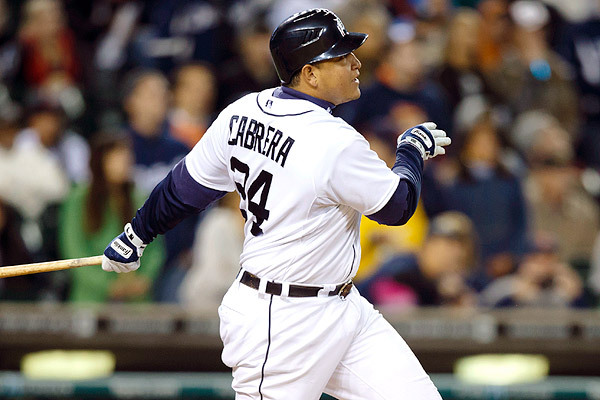 Mike Trout or Miguel Cabrera will be the American League MVP. Either is the right choice, but who had the better season? Trout had a 10.7 WAR. Not sure just how amazing this number is? It qualifies as the 26th best mark of all time, excluding the dead ball era. He played a premium defensive position and played it well. He led the league in stolen bases. Miguel Cabrera won the triple crown, a feat only achieved by 17 men in the history of the game and not since Carl Yastrzemski’s epic 1967 season. He also had an OPS of .999, the best mark in the league. He played third base and was pretty meh. Cabrera’s team won their division, but Trout’s team was better, winning more games in a much, much tougher division. It’s pretty clear to me that Trout was the better player in 2012, that 10.7 WAR is really the beginning and end of the discussion, but he played in 139 games while Cabrera played in 161. Twenty-two extra games creates value beyond just the player’s production, since Cabrera’s presence in the lineup will dictate play in a way that’s beneficial to the team, from things like intentional walks to an increase in fastballs for the batters hitting before and after Cabrera. Winning the triple crown is incredibly difficult, it can’t be downplayed, it’s simply an extraordinary accomplishment. It’s not an automatic measure of greatness in a statistical sense, of course, because batting average and RBI’s are relatively unimportant statistics in defining a player’s overall value, but the combination are exceptional at defining a particular season’s worth. Driving in runs depends on your teammates getting on base first, something that is out of a player’s control, and batting average is less important than on-base percentage. Consider two players who both have a .350 OBP, both hit 20 home runs, but one drives in 100 runs and the other drives in 80. That particular disparity means next to nothing in determining which player is better since it speaks to a variety of factors outside the players control. In a single season, though, even if some of his most impressive statistics existed because of factors outside his control, Cabrera was still the best at hitting safely (and he did it with a significantly lower BAbip that Trout) and driving in runs and the one statistic that can never be over-valued, hitting home runs. Just because two of those things are flukey and they’re a lousy indicator of what he’ll produce in 2013, he still had to do it, and he did it better than anyone else in 2012. The 45 years between triple crown winners tells you everything about how difficult it is to achieve. Trout was the better overall player, there’s no other way to see it, but since there are no specific criteria for the MVP award, my pick is Cabrera’s random style of greatness rather than Trout’s overall greatness. After all, baseball is never just about the numbers.